Elsa C. Sistos started her career in the petroleum industry following graduation from California State University, Northridge with a BS in Mechanical Engineering. Elsa worked as a project manager for Mobil Oil Corporation in 1991. Her responsibilities were to manage multi-million dollar projects from inception to completion. She was responsible for all aspects of the project from managing the finances, schedule, design, safety compliance and construction. She resigned from Mobil Oil in 1996 to be a stay-home mom for her daughter. 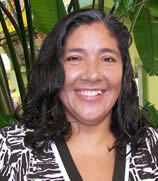 In 2004, she joined the workforce again at Shopping Partnership as the office manager, working part-time. Her experiences as a project engineer and as an active parent volunteer in her daughter's school made her a perfect fit with this company.